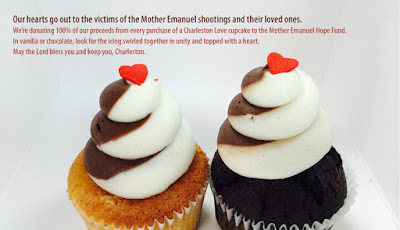 Cupcake DownSouth is currently offering the “Charleston Love” cupcake, a sweet treat that the business will donate all of the proceeds from to the Mother Emanuel Hope Fund. The cupcakes are $2.95 and are available in chocolate or vanilla cake, with vanilla and chocolate icing swirled together and topped with a red heart. They will be available until July 5, 2015.